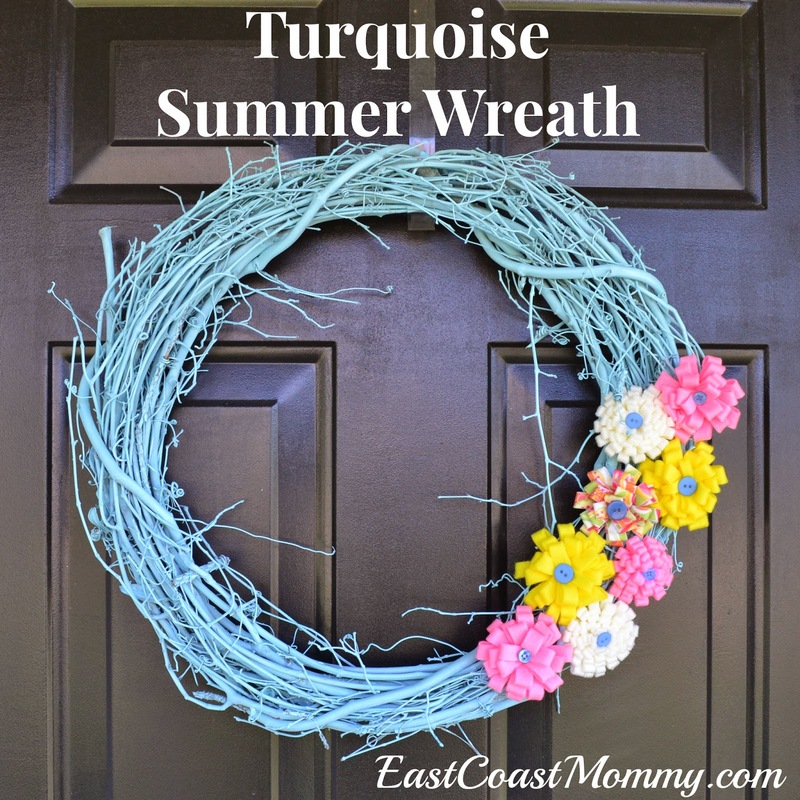 I don't get a lot of time to work on "grown up" craft projects, but yesterday I finished a new turquoise wreath for my front door. It was really easy to make, and I love how it turned out. 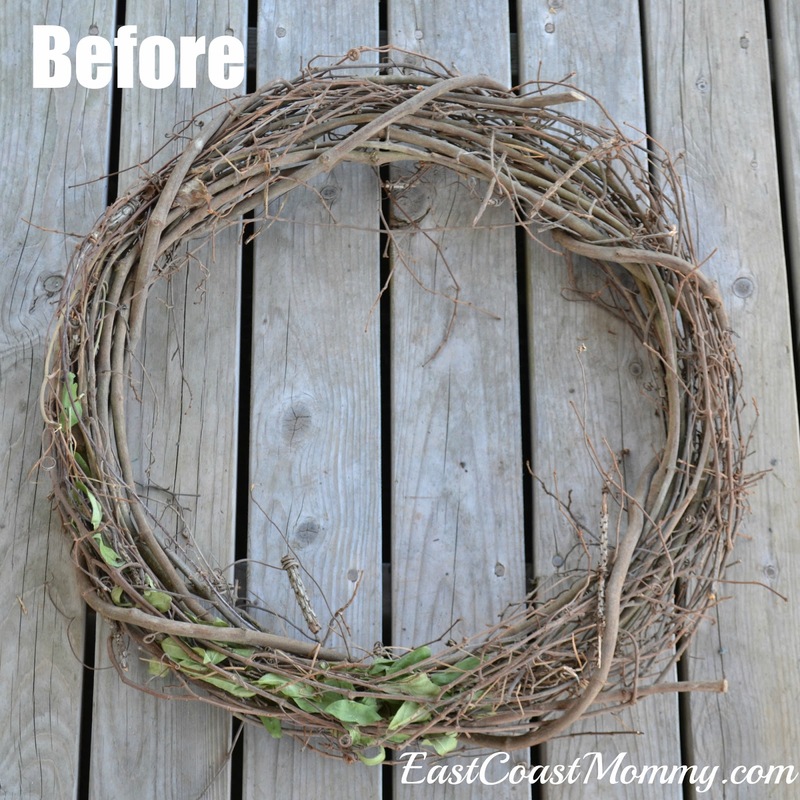 Isn't it a fantastic summer wreath? 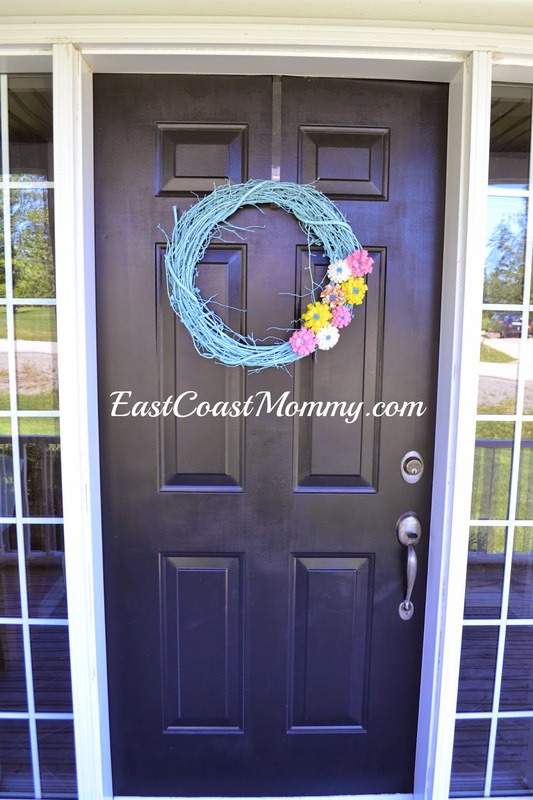 I really like the blue grapevine wreath, and the flowers are so bright and cheerful. Then, I spray painted it, and added some fun felt flowers (that I made using the tutorial you can find here). These flowers are really simple to make. 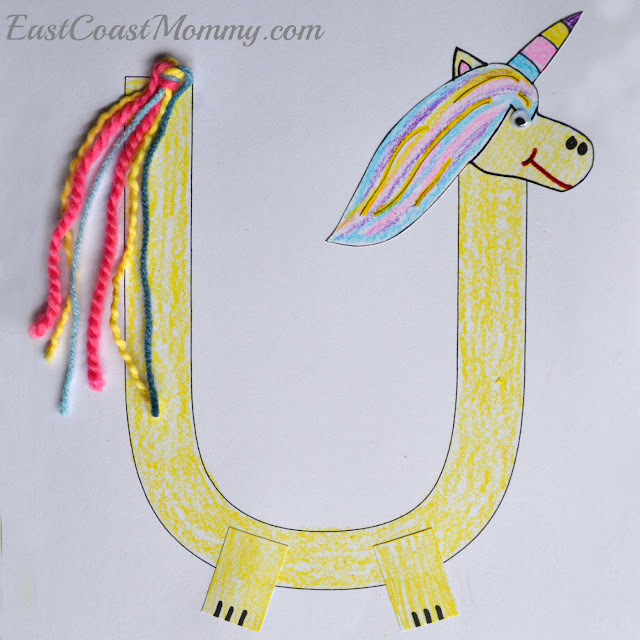 All you need is some brightly colored felt, scissors, a glue gun, and a few buttons. I am really enjoying my new summer wreath. What do you think? If you make one, let me know how it turns out. First, my little guy brought presents for his friends and his teachers. Every celebration needs gifts, right? Then, we made sure to get a picture of my son with his teachers. I think a child's first teachers hold special places in their hearts forever, don't you? 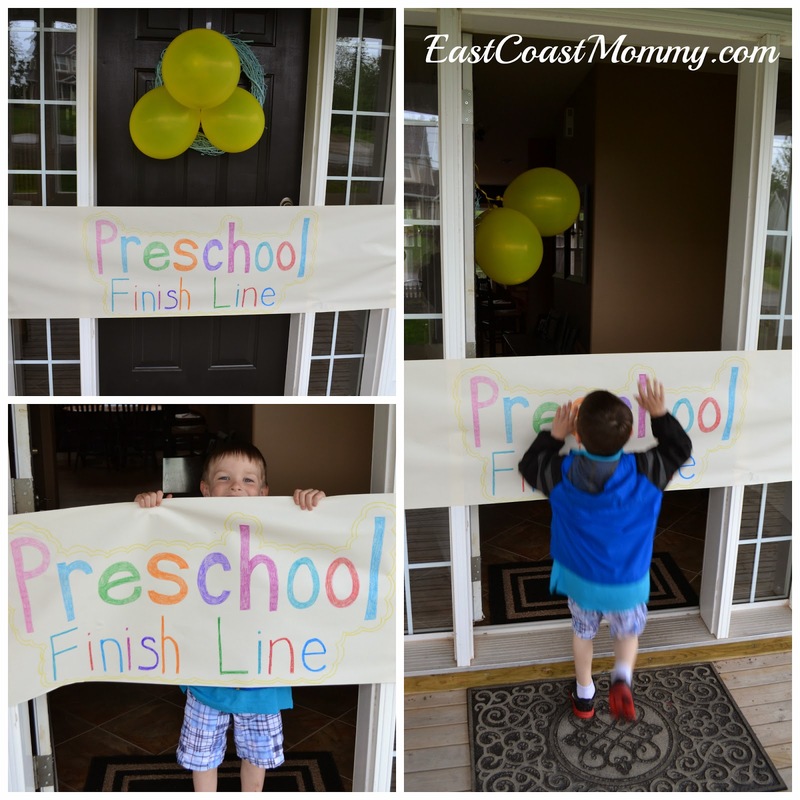 Finally, I surprised him with a Preschool Finish Line after school. He loved it! We even had to tape it back together so he could do it again. 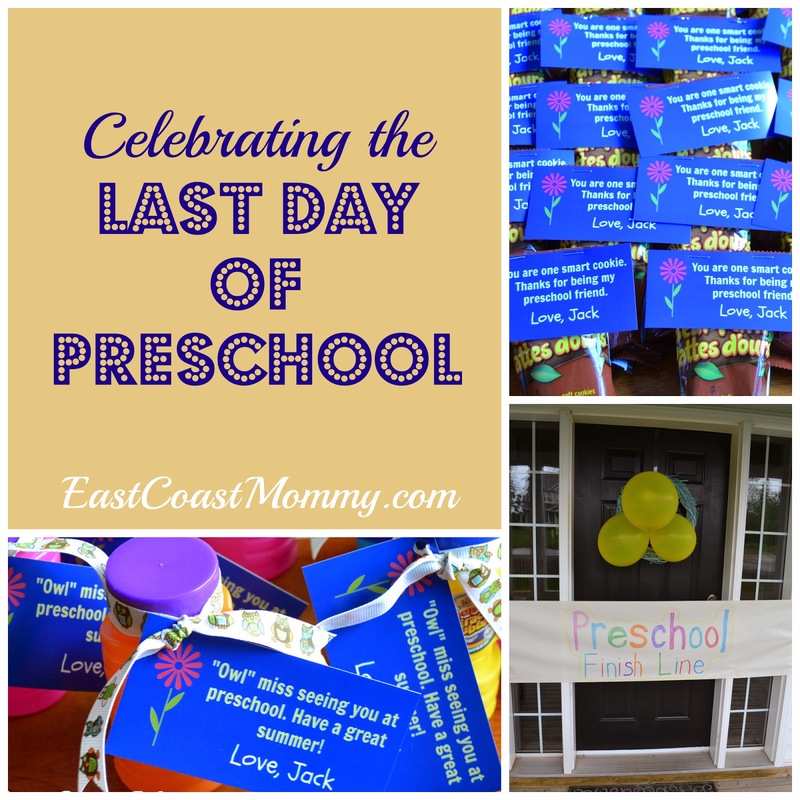 When my little guy started Preschool, he cried at drop off for months. He only attended Preschool two days a week (for a couple of hours each day), but it took him a long time to let me leave without crying. It's funny how life come full circle. Today, on his last day, he was all smiles... and I was the one with tears in my eyes. I have no idea how I am going to survive his first day of "big school" in September. 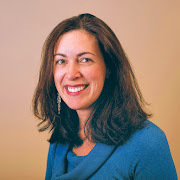 Anyone have any tips for this sad Mommy? 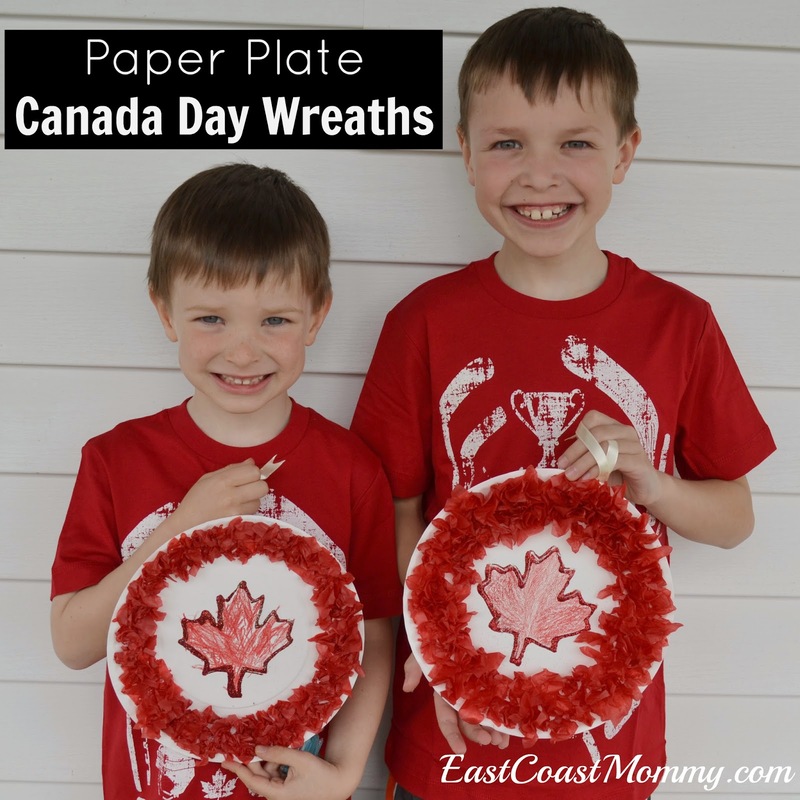 Canada Day is just around the corner, so I wanted to share the adorable Canada Day wreaths my boys made from paper plates and tissue paper. Aren't they cute? 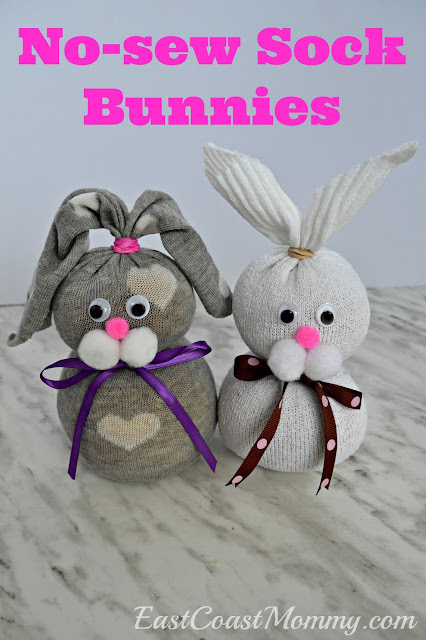 I am sharing the full tutorial over at CBC Parents. 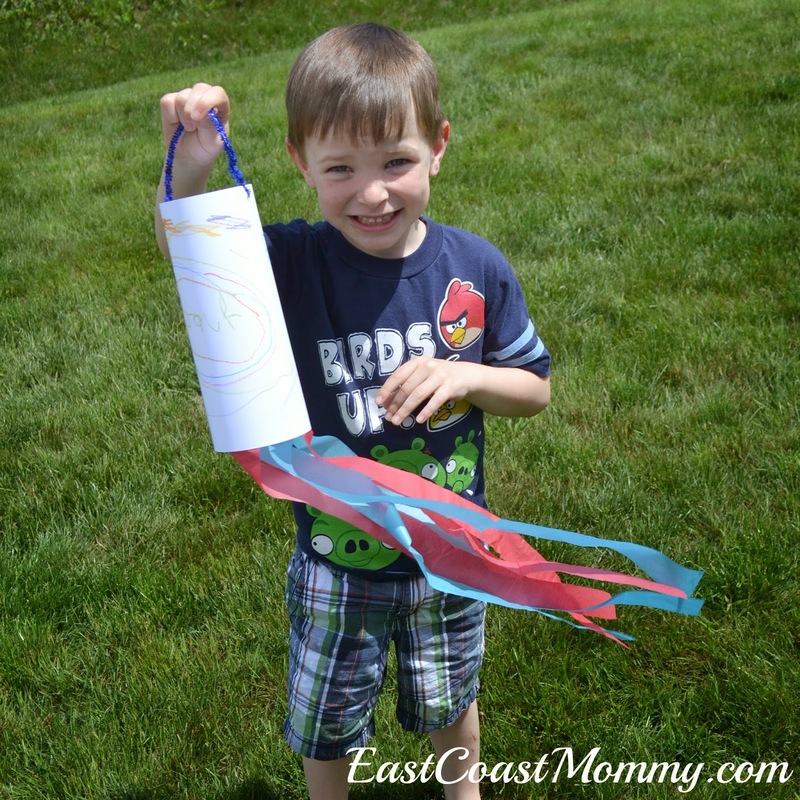 Come on over and see how easy it is to create your own Canada Day Decor. My 4 year old and I are getting close to finishing our "crafting our way through the alphabet" adventure. 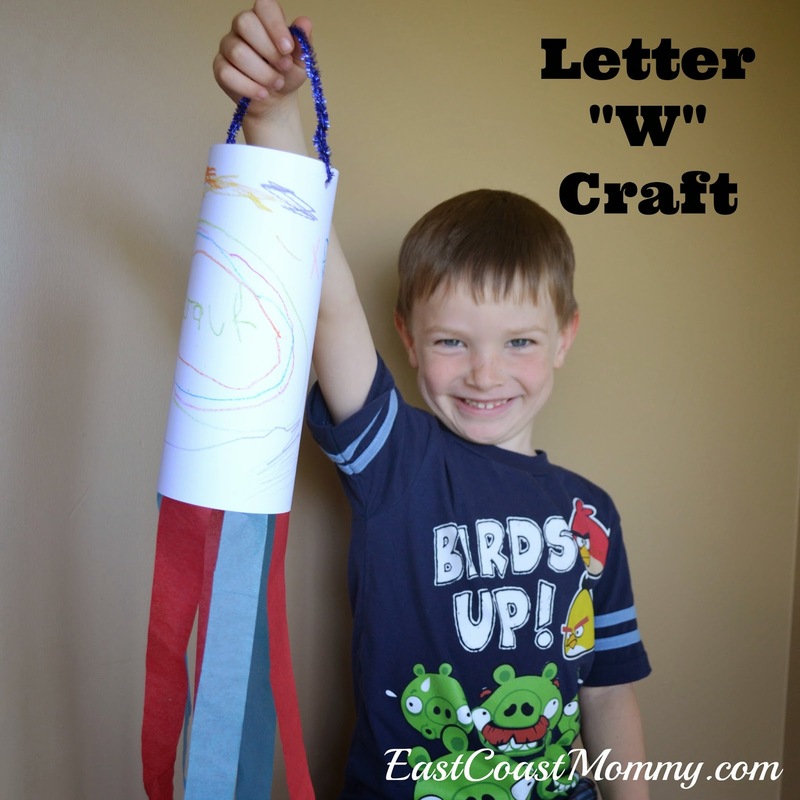 Yesterday we made a Windsock craft and did some Letter W printing practice. 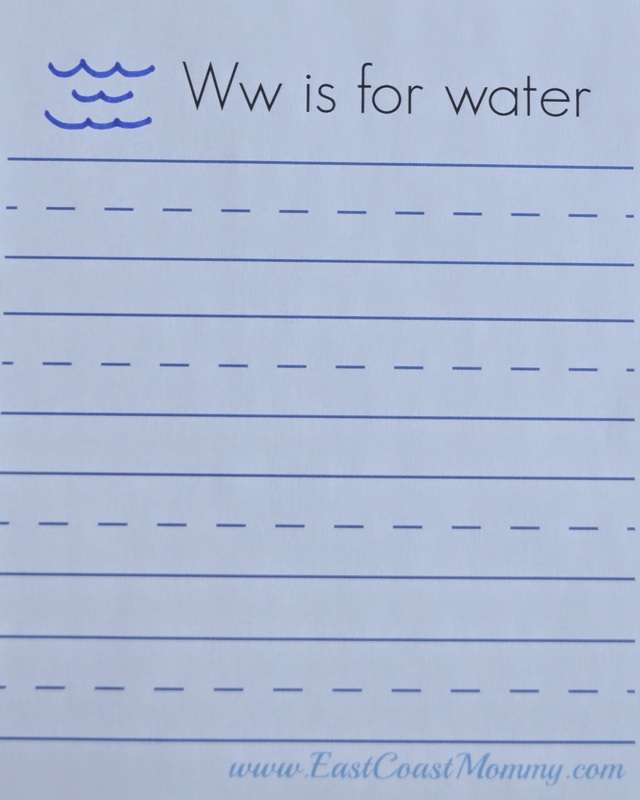 1) Color a piece of white card stock. 2) Roll the card stock into a tube, and tape in place. 3) Punch some holes in the top of the tube, and add a pipe cleaner handle. 4) Tape strips of tissue paper to the bottom of the tube. Cute, right? 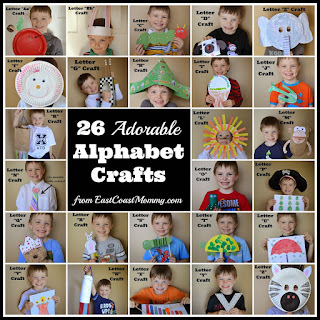 I think this is a great summer craft. My little guy had a fantastic time running around the yard... and telling me which way the wind was blowing. After our craft, we did a bit of printing practice. 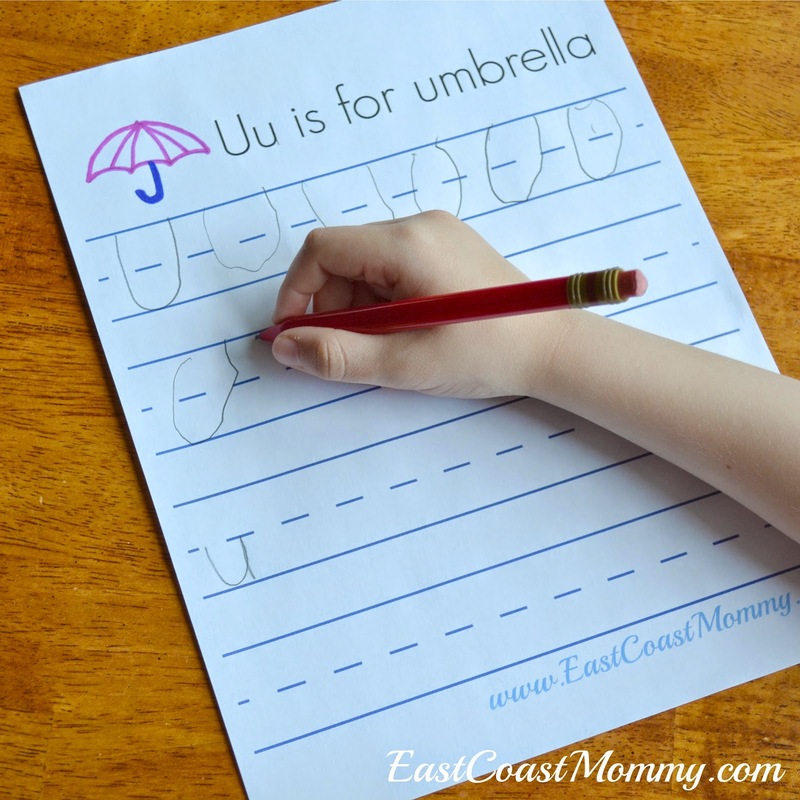 To practice writing the letter W with your little one, right click on the picture below, save it to your computer, and print. 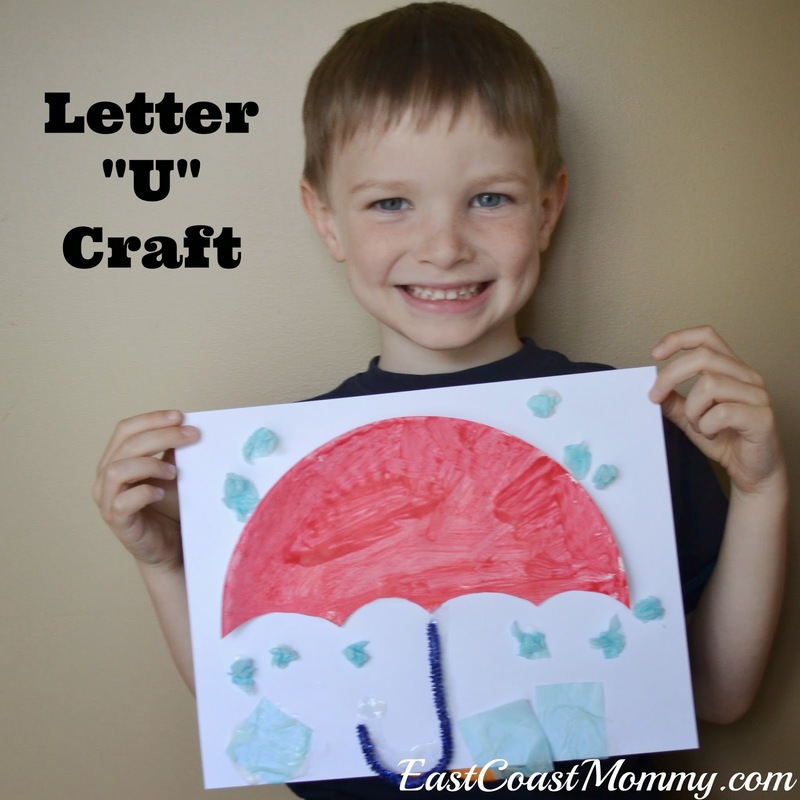 Interested in more "letter w" crafts? With some construction paper, crayons, scissors, glue and googly eyes, you can easily make this "letter W walrus". 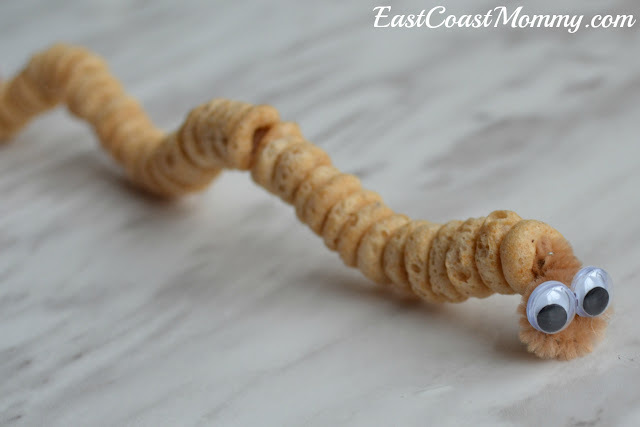 How cute is this worm made of Cheerios? Twist the end of a pipe cleaner into the shape of a head, and glue on two googly eyes. Then, have the child thread the Cheerios onto the pipe cleaner, and when the child is finished, twist the end to secure the Cheerios. Fun, right? Next up, the letter "X"! My 4 year old has spent the last year with two fantastic preschool teachers, so on his last day (Thursday), he is bringing them each a special gift. 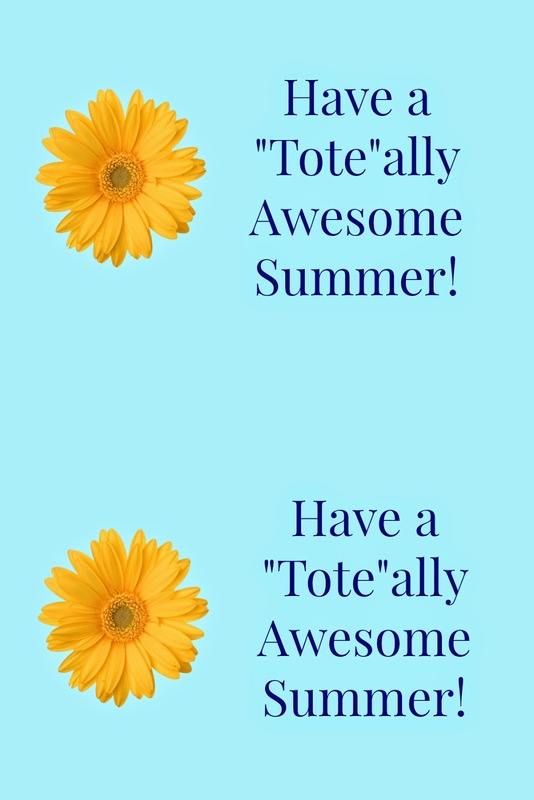 Each of his teachers will receive a pretty summer tote bag with a tag that says, "Have a 'Tote'ally Awesome Summer!" Cute, right? 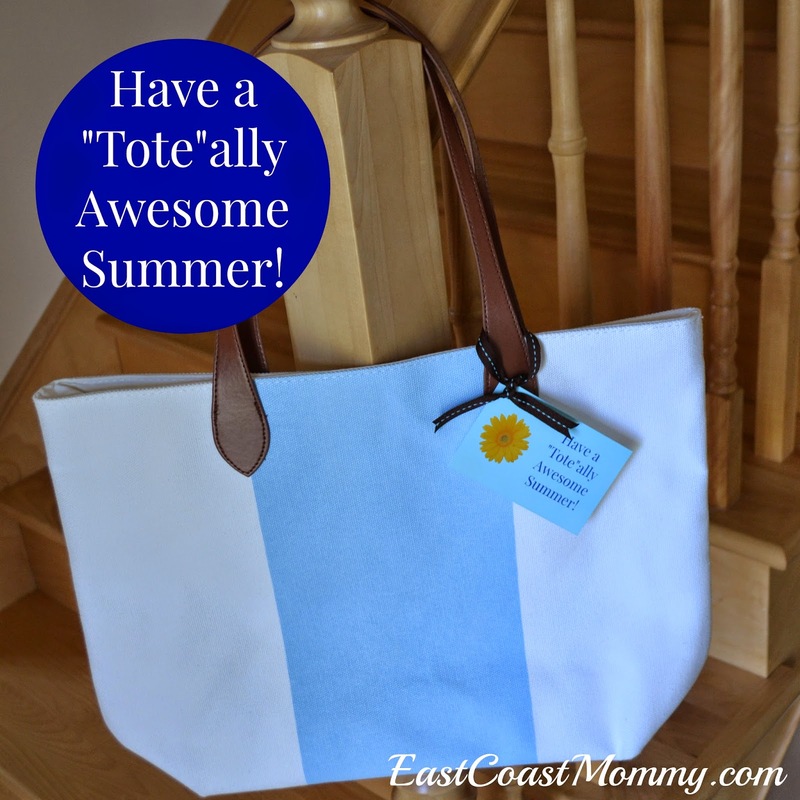 I think it is the perfect bag for trips to the park or beach this summer. If you would like to download and print the 4X6 tag I designed, just right-click on the picture below, save it to your computer, and print it like a normal photo. I love how bright and cheerful this little tag is, don't you? 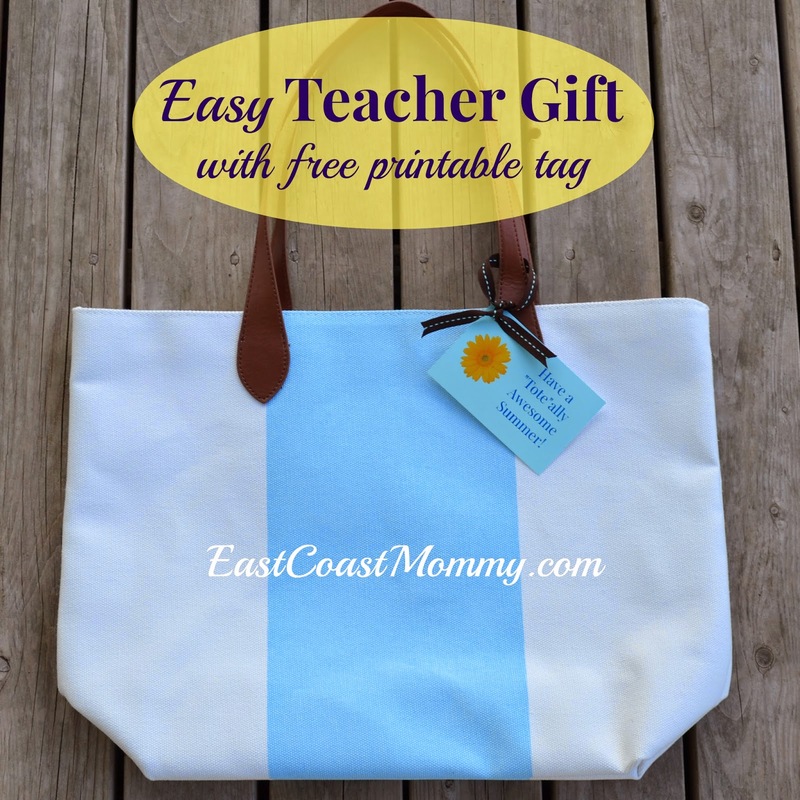 What is your best teacher gift to give/get? 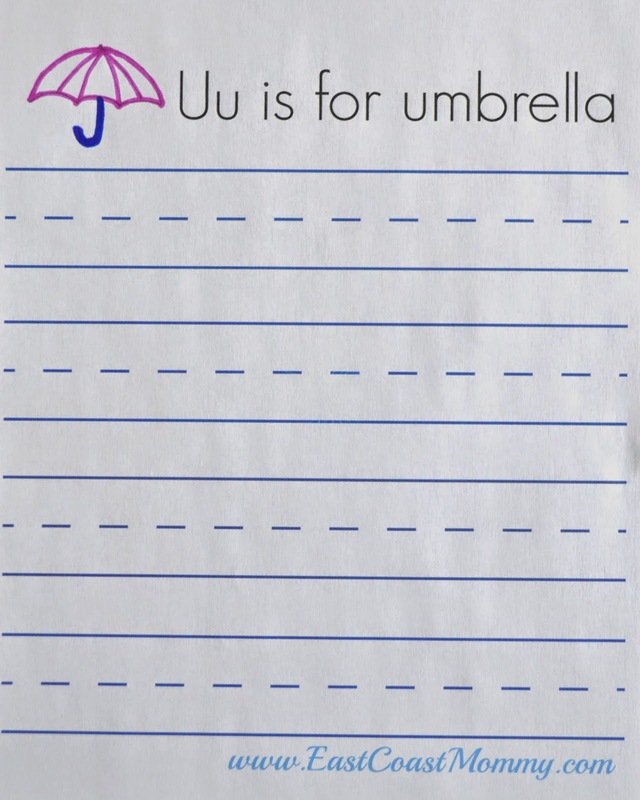 I always like giving things that are useful. Gift cards and special notes are always great choices. Our school year is winding down, and today I am sharing the class treats my 6 year old is sharing with his friends on the last day of school. 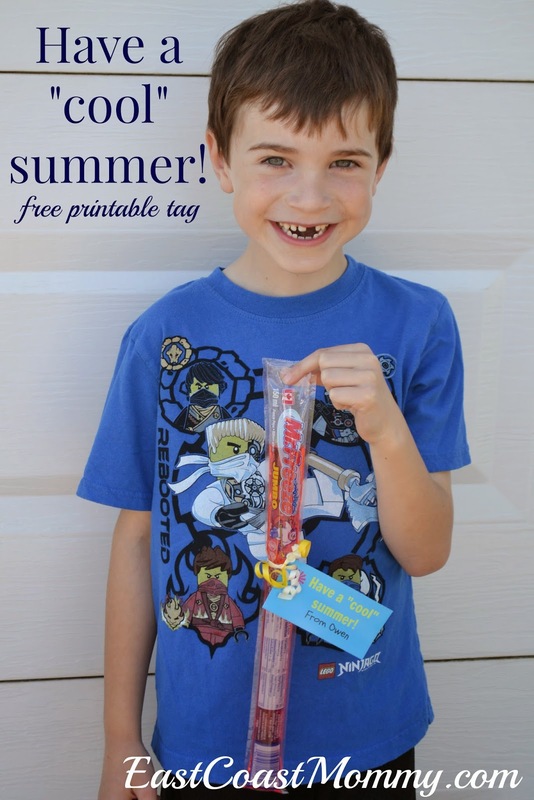 He is bringing large freezies with little tags that say, "Have a cool summer!" Cute, right? I love how simple this idea is, and my little guy is anxious to share these fun treats with his classmates on Wednesday. Here are all our treats ready to go! 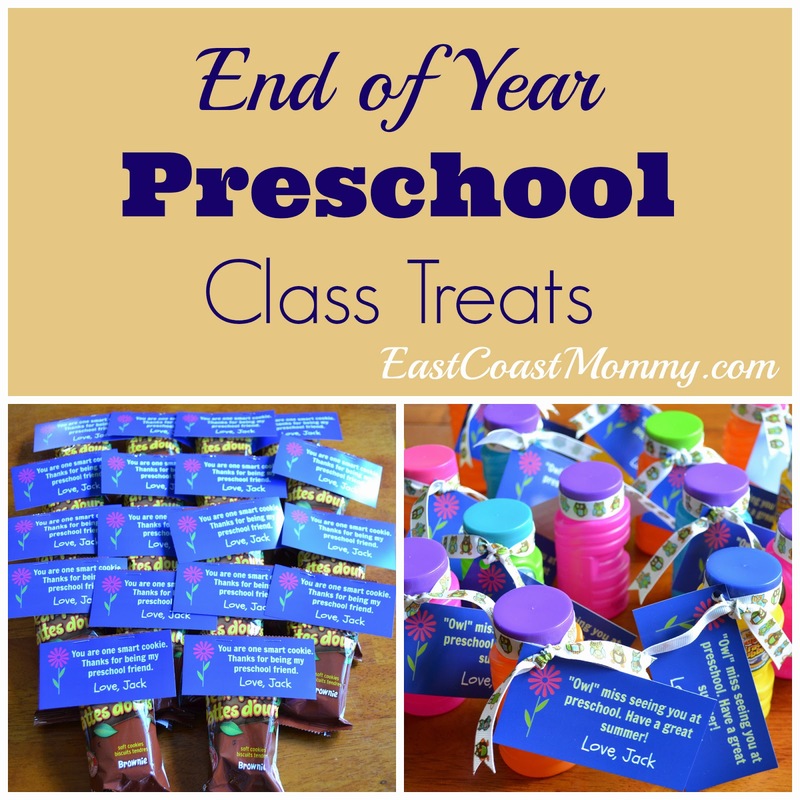 The only thing better than these class treats are the lazy days of summer that are sure to follow! 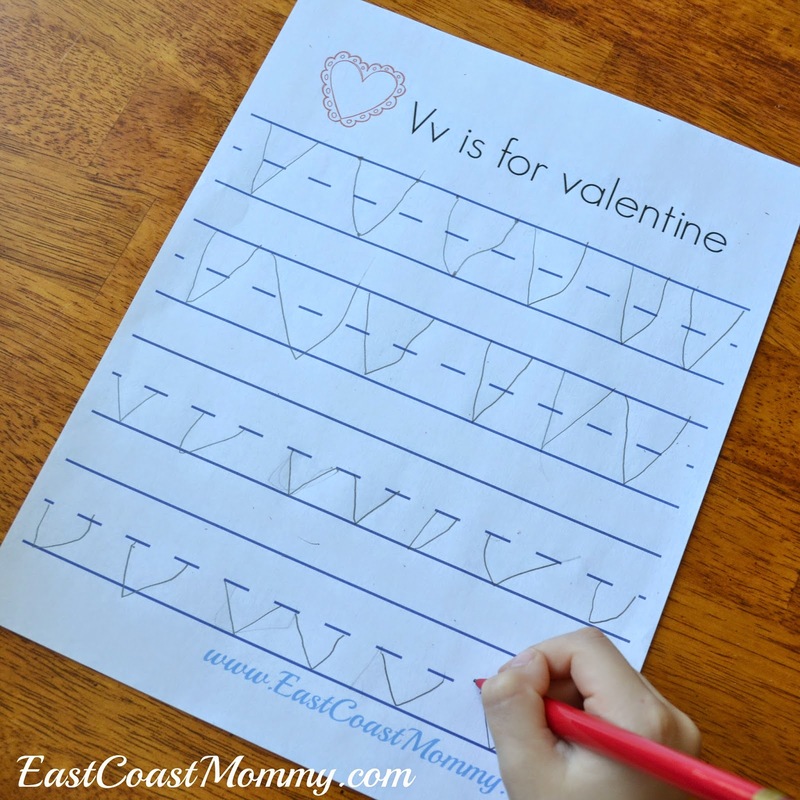 My 4 year old and I are continuing to craft our way through the alphabet, and yesterday we had some fun with the letter V. We made a Vase craft (with thumbprint flowers), and we did some letter V printing practice. 1) Draw a simple vase shape on a piece of paper. 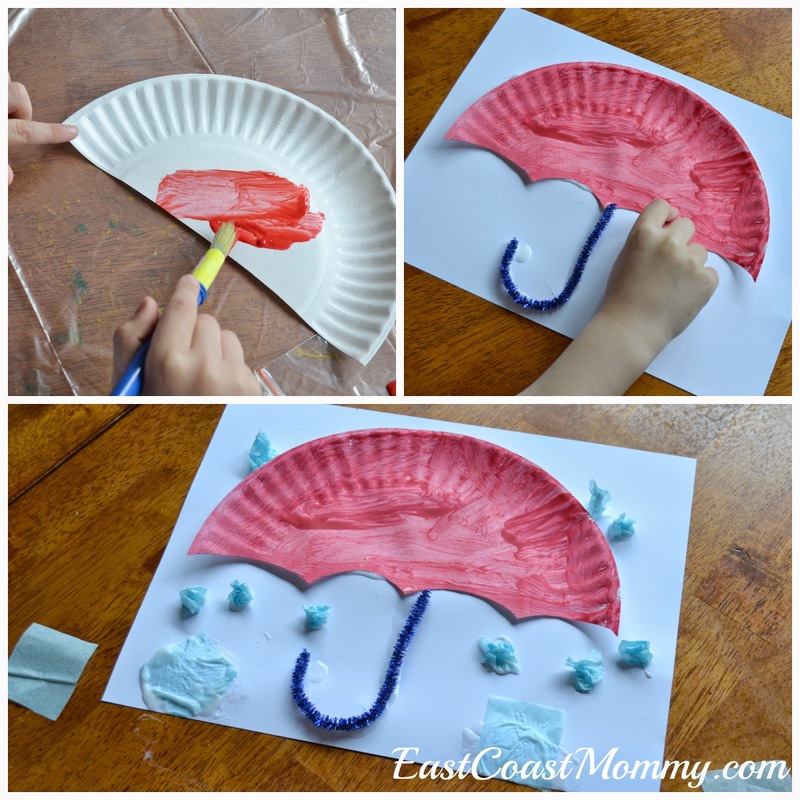 3) Use paint to make "thumbprint" flower petals. 4) Add stems and leaves to the flowers (with crayons), and glue buttons onto the centre of the flowers. Cute, right? After our craft we did a little printing practice. 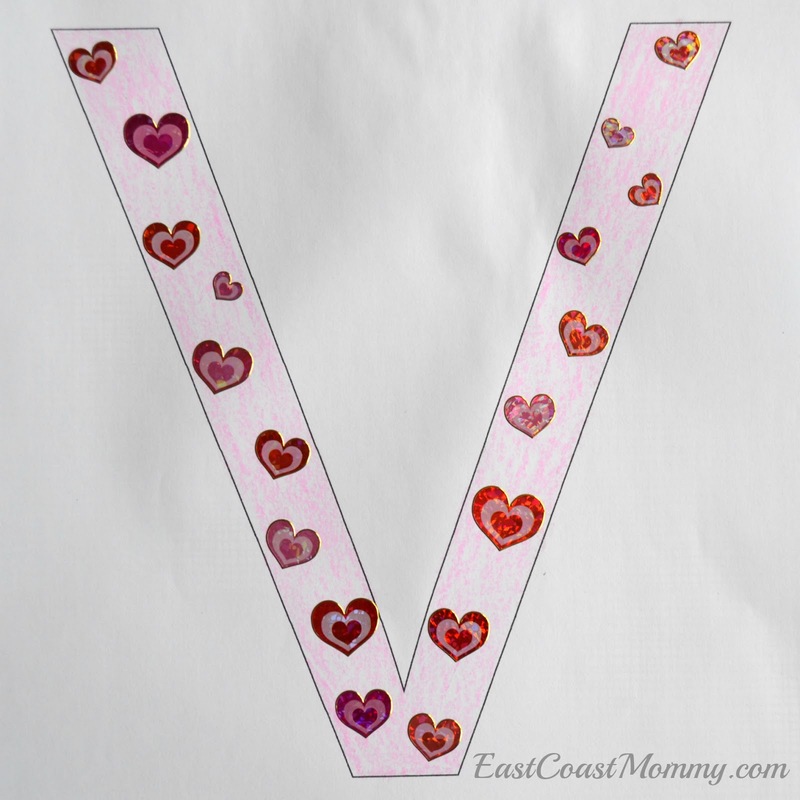 If you want to practice printing the letter V with your little one, you can right-click on the picture below, save it to your computer, and print it. 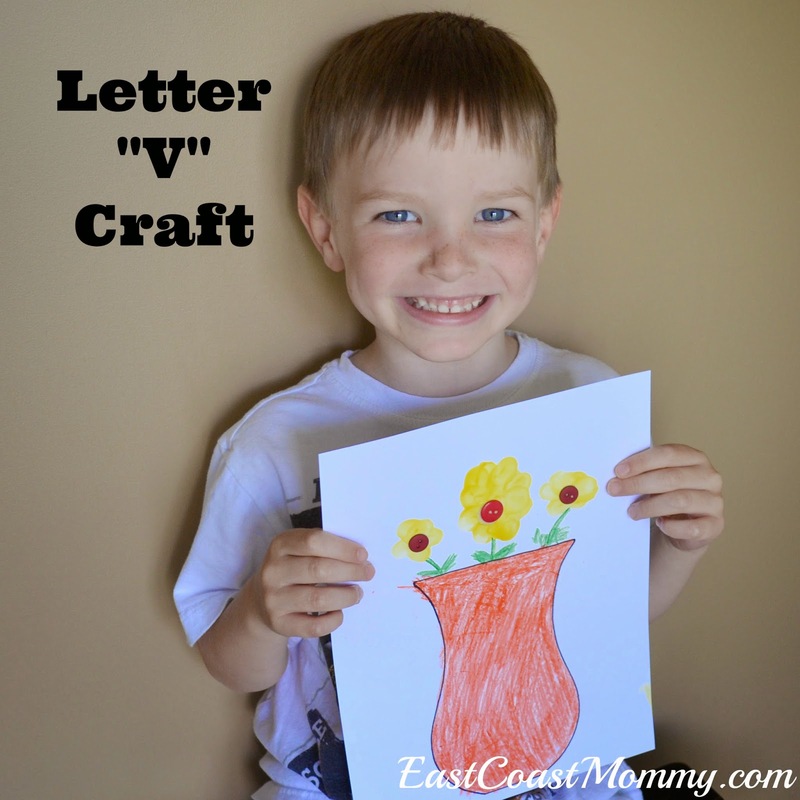 Interested in more "letter v" crafts? Check out this simple "letter v" volcano. 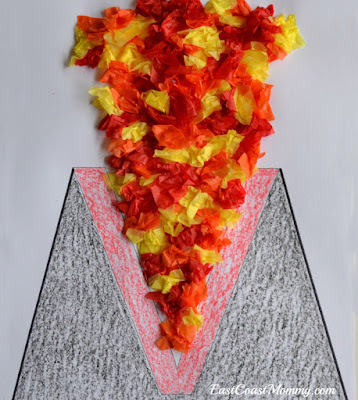 Draw a letter V and add some lines to make a volcano. Then, scrunch up bits of tissue paper, and glue them onto to the paper to create lava. V is also for Valentine's Day, so you could add heart stickers to a V.
And, this "v is for vase" craft could not be cuter. 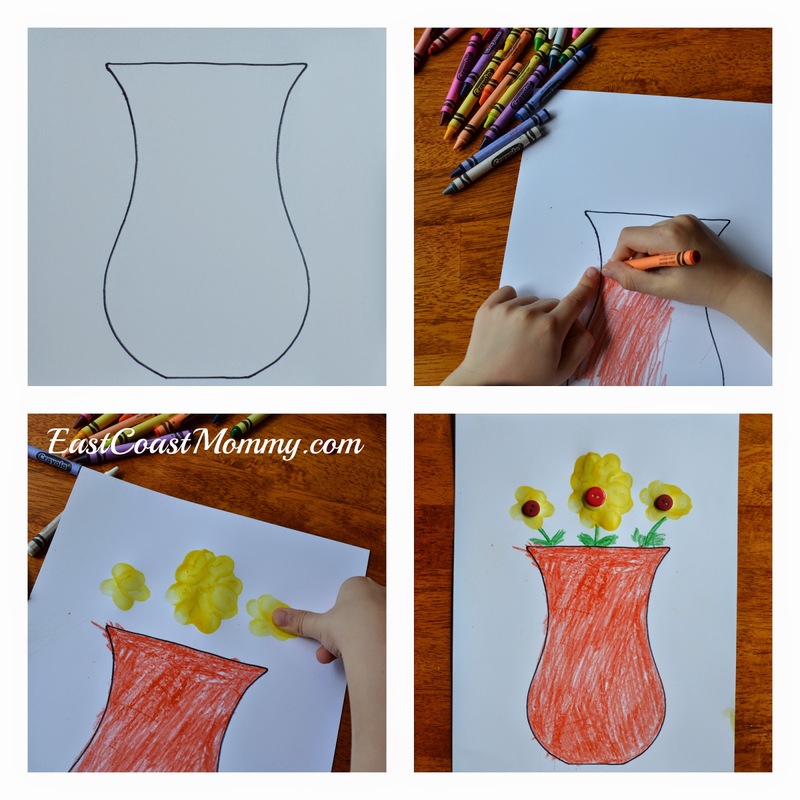 Decorate a vase shape, and make a flower using cardstock, crayons, a picture of the child, and paper straw stem (secured with tape). 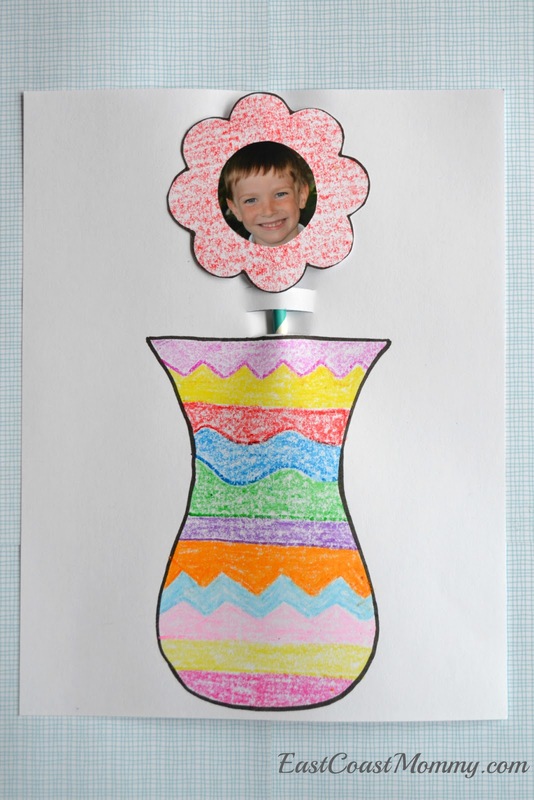 Cut a couple of slits above the vase, and insert the flower. I love this one! Fun, right? 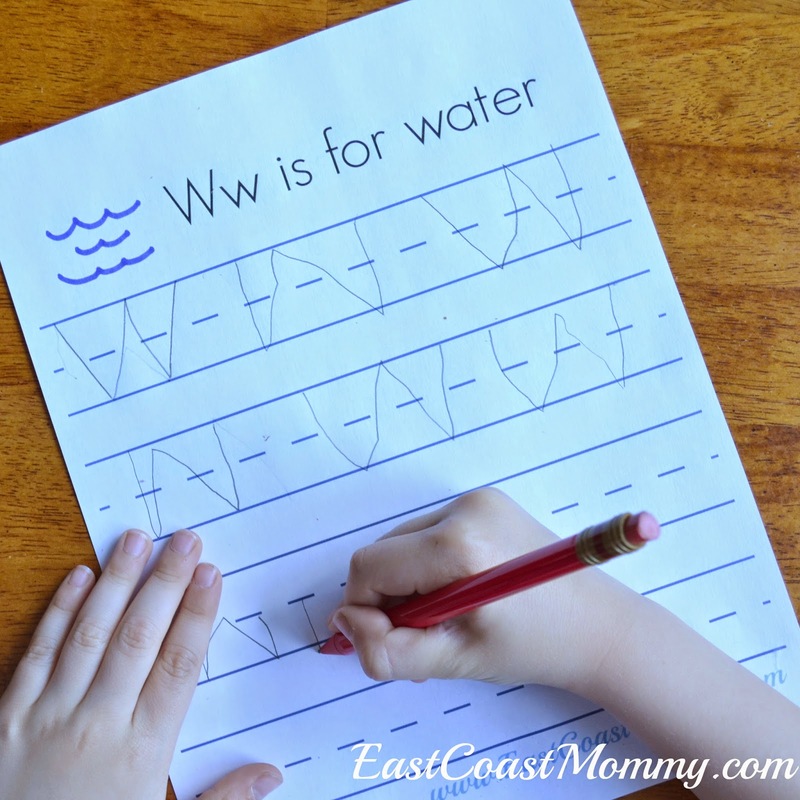 Next up... the Letter W! 2) My boys play the best games. -- My house is full of LEGO, mini sticks, light sabers and race cars. We may not have a single princess dress, but our dress up box is brimming with Jedi robes, super hero capes, pirate clothes, and hockey jerseys. 3) My boys are best friends and they build fantastic forts together. A few blankets, pillows, and chairs can keep them entertained for hours. 5) My boys give big hugs and heartfelt kisses. 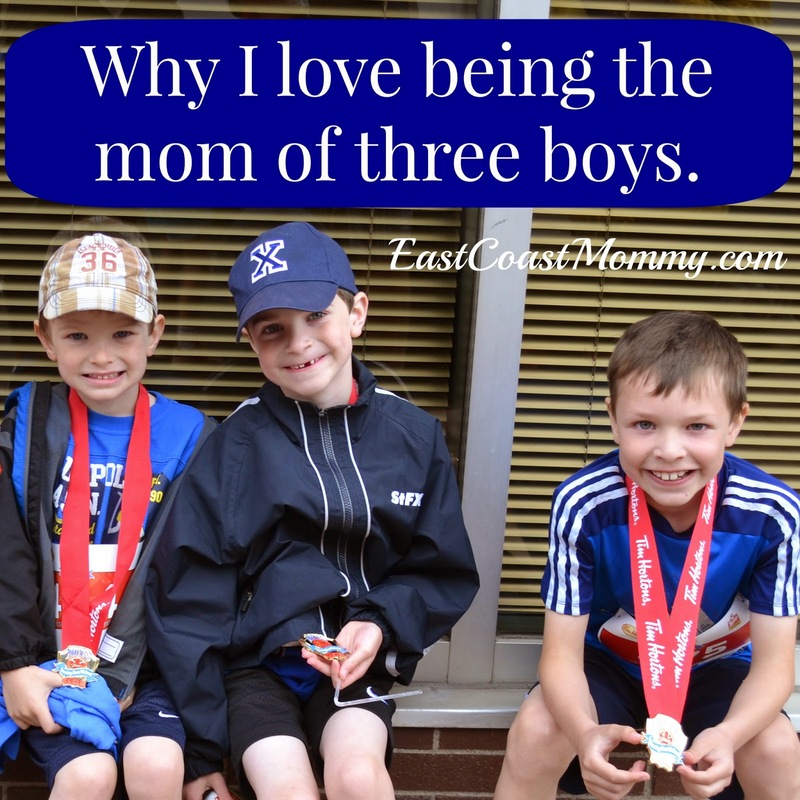 -- They are also awesome cuddlers... and they love their mom! 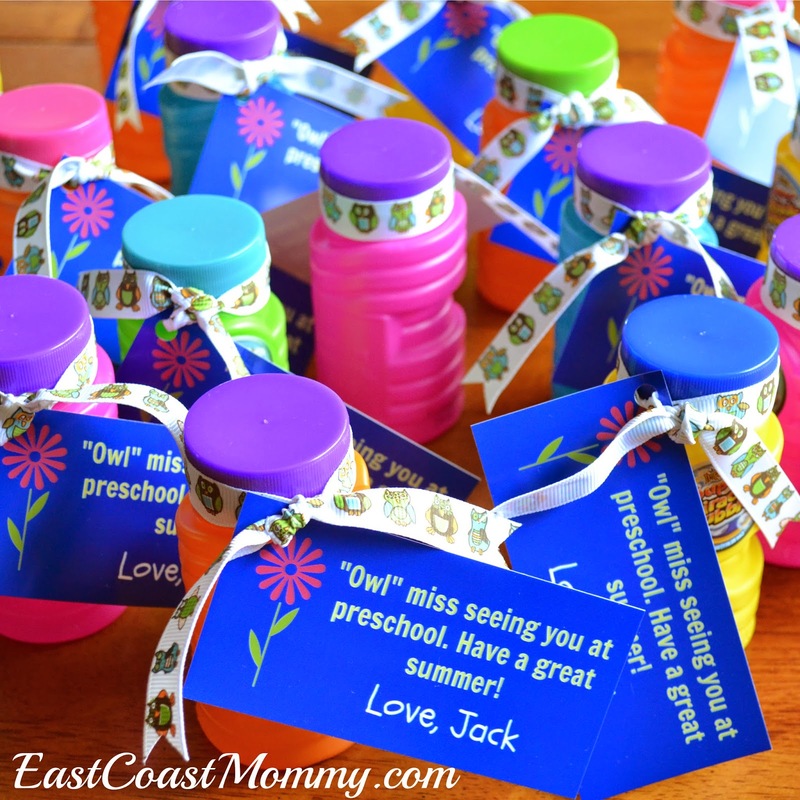 My 4 year old has been going to preschool on Tuesday and Thursday mornings, and he wants to bring little treats to his friends on their last days together. 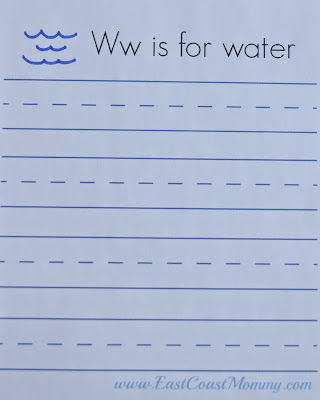 I came up with two simple ideas, and I have included the details (and free printable tags) below. 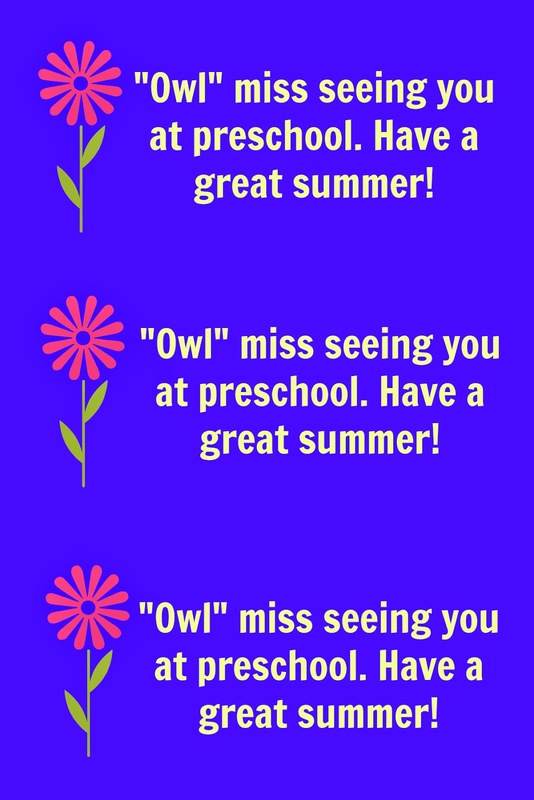 For his Tuesday friends, he is bringing bubbles wrapped with little "owl" ribbons and tags that say, "Owl miss seeing you at preschool. 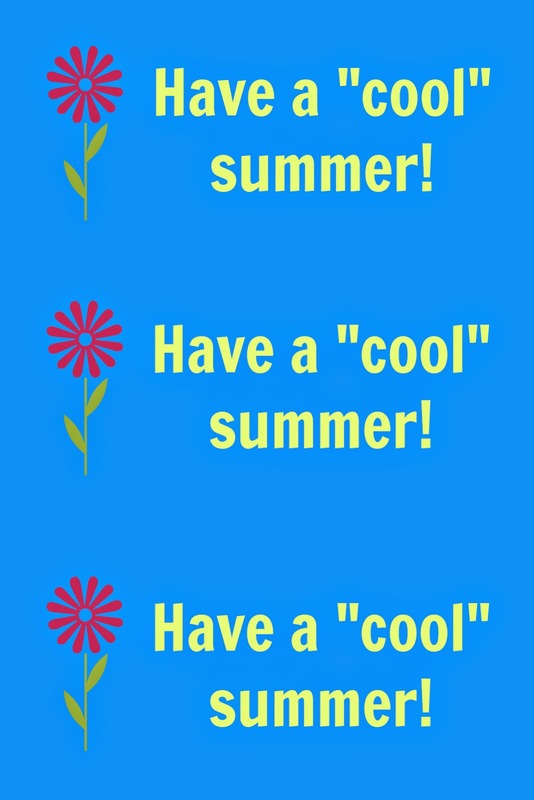 Have a great summer!" To download the tag, right-click on the 4X6 photo below, save it to your computer, and print it. 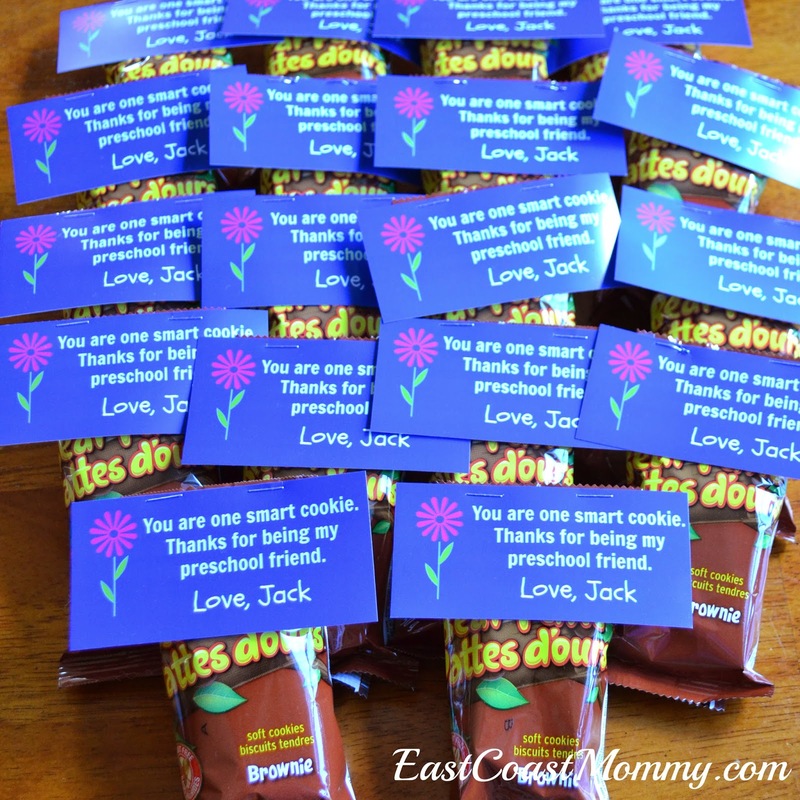 For his Thursday friends, he is bringing cookies with tags that say, "You are a smart cookie. 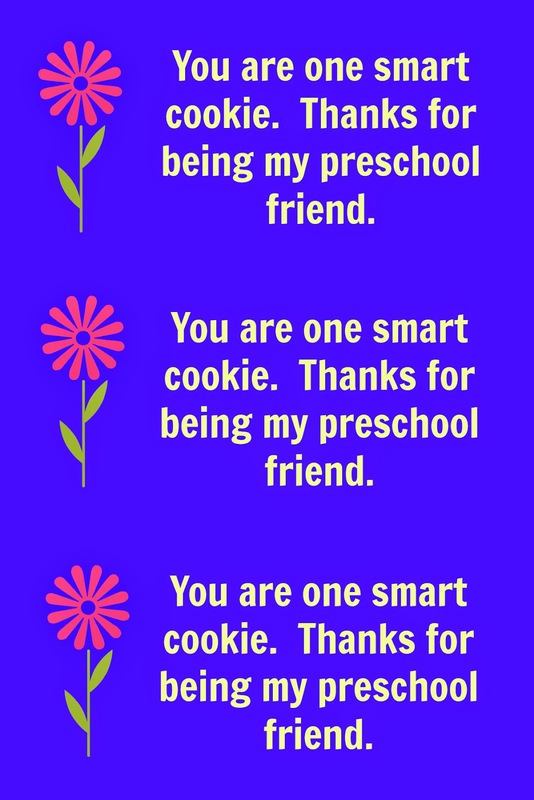 Thanks for being my preschool friend." I can't wait for my little guy to share these treats with his preschool friends next week. He is pretty excited to hand them out. 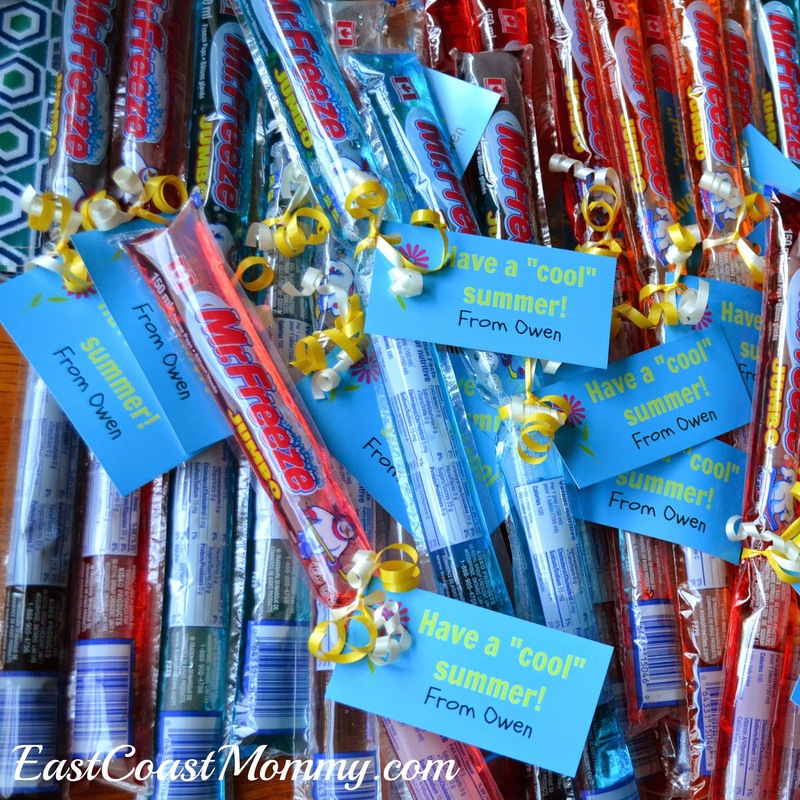 Do your kids like to pass out class treats on the last day of school? It's that time of year again -- school is ending and summer vacation is just around the corner. 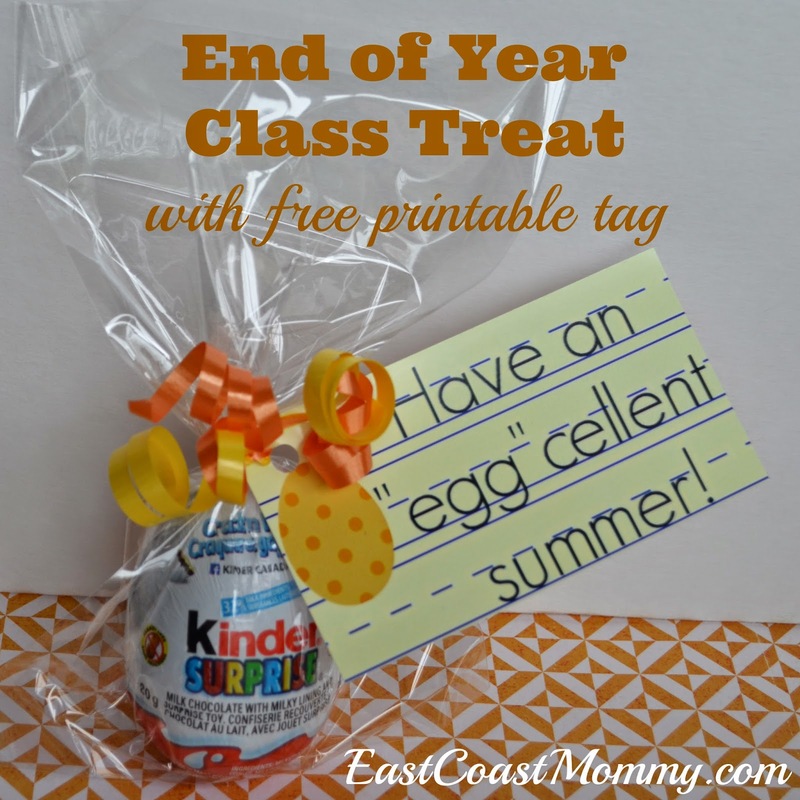 My boys enjoy bringing little gifts to share with their classmates on the last day of school, and today I am sharing an idea for a fun treat little ones will love (and I have designed free printable tag for you to download). Cute, right? My boys love Kinder Eggs. What's not to love about a chocolate treat and a toy surprise? If you want to make these treats for your child's classmates (or just for your little ones as a special "last day of school" surprise), just right click on the 4X6 picture below, save it to your computer, and print it like a normal photo. 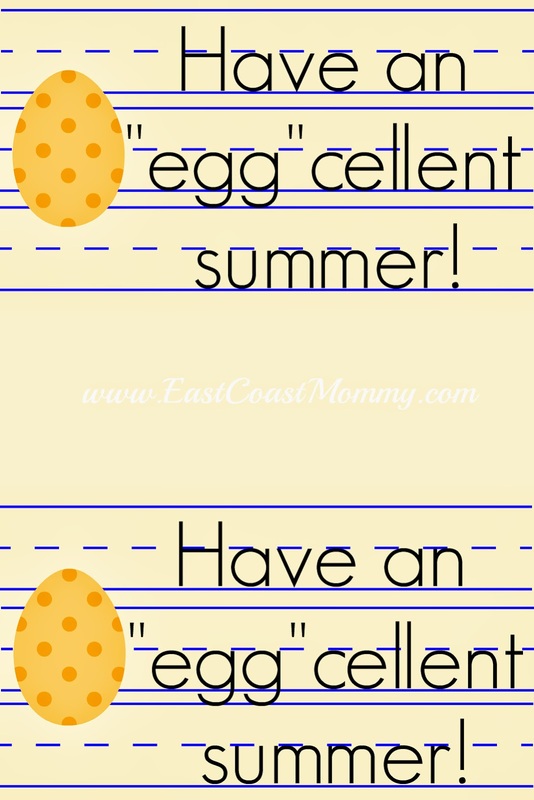 We are really getting excited for summer around here, and we have already started to work our way through our Summer Checklist. 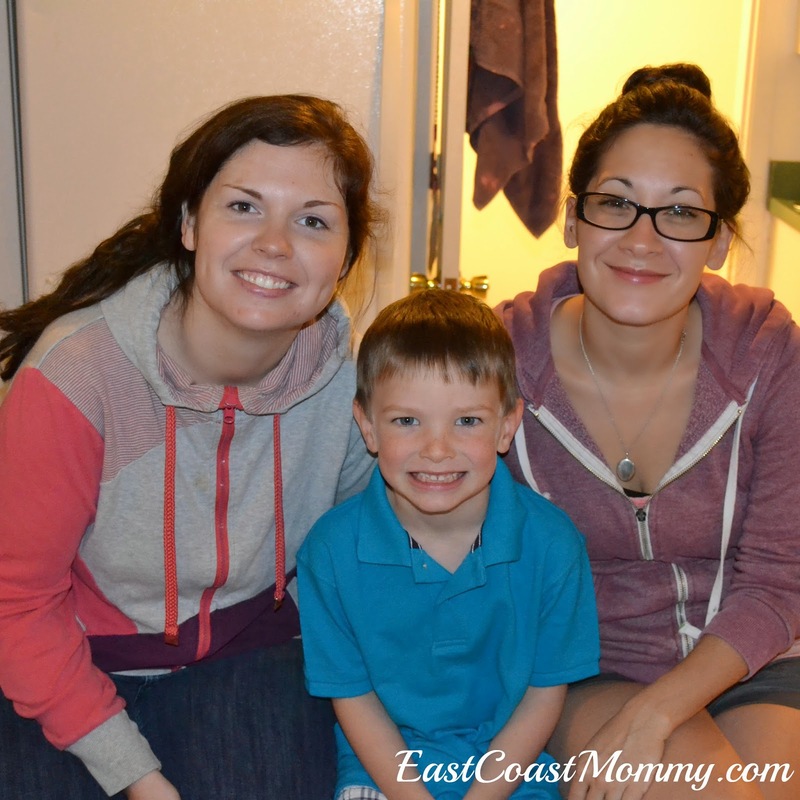 We are especially looking forward to our road trips to Halifax and PEI. Maybe I'll pop a few Kinder Eggs into my purse to keep the boys happy in the van. What are you most looking forward to this summer? I'd love to hear about the summer adventure you have planned with your family. Disclosure: I’m part of theKinder® Mom program and I receive special perks as part of my affiliation withthis group. The opinions on this blog are my own. 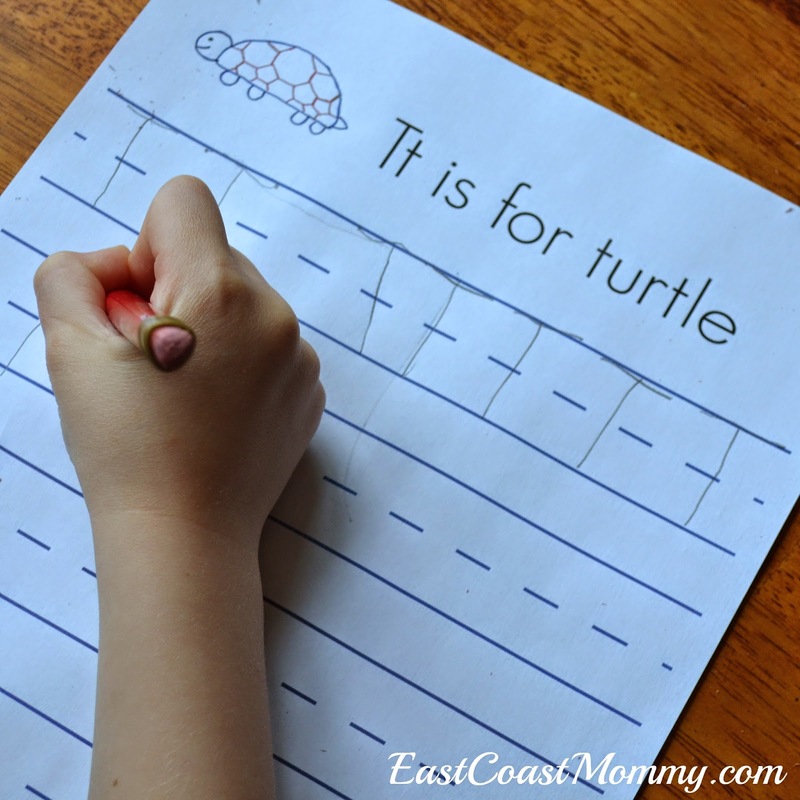 My 4 year old and I are continuing to craft our way through the alphabet, and yesterday afternoon we had some fun with the letter T. We made a turtle puppet from a paper plate, and we did some letter T printing practice. 1) Cut a paper plate in half. 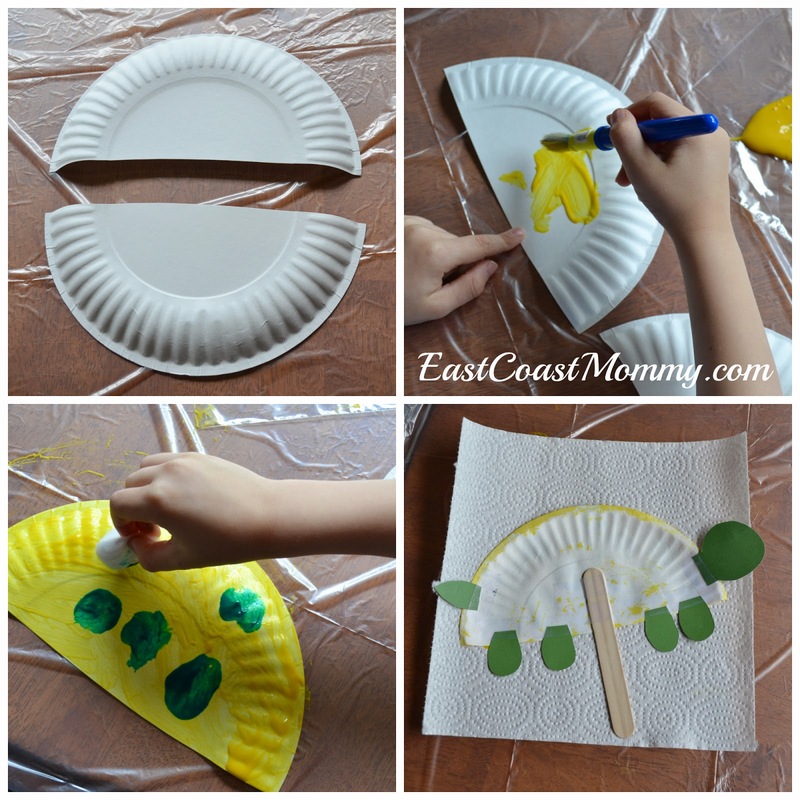 2) Paint the paper plate yellow. 3) Use a cotton ball to add green dots to the turtle's shell, and allow to dry completely. 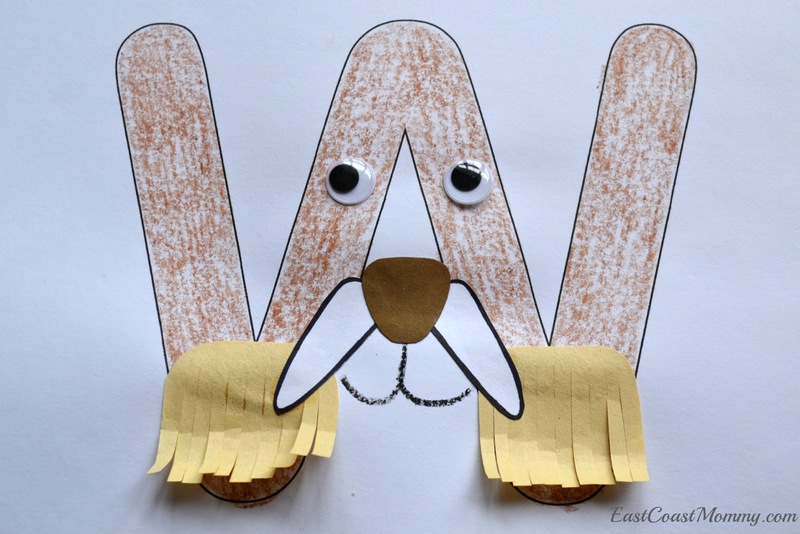 4) Cut a head, 4 legs and a tail from green construction paper, and tape to the back of the paper plate. 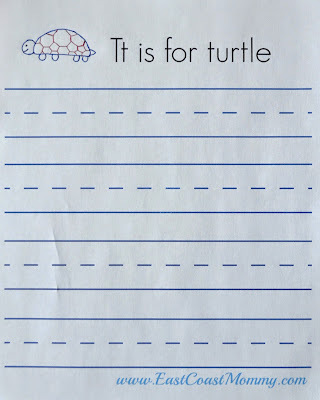 5) Tape a craft stick to the back of the turtle. 6) Glue on a googly eye, and draw on a mouth. That's it! Isn't it a cute little craft? After our craft, we did a little printing practice. If you want to practice printing the letter T with your little one, you can right-click on the picture below, save it to your computer, and print it. 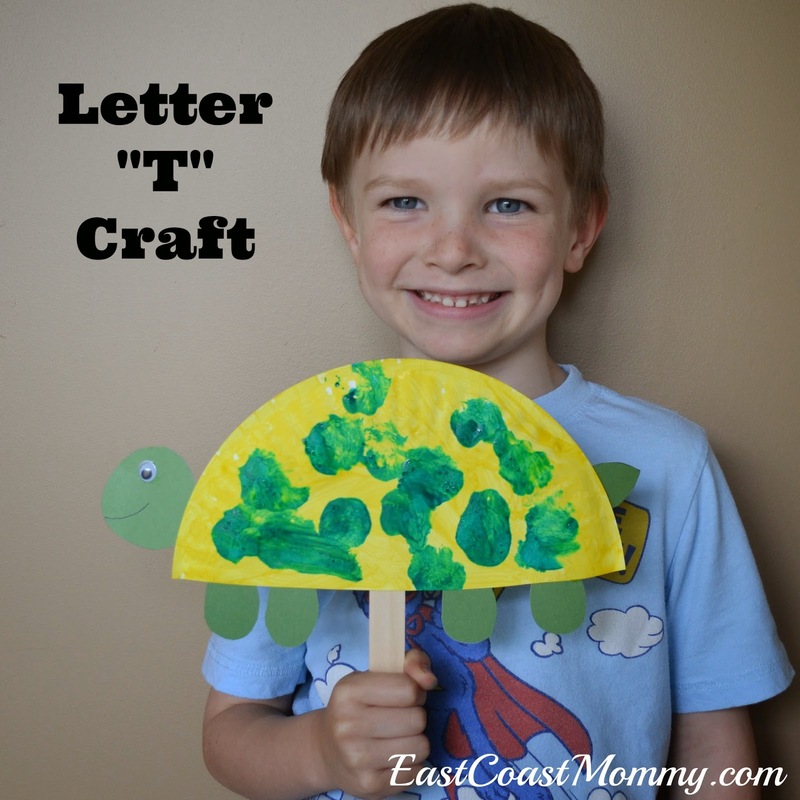 Looking for more "letter T" crafts? 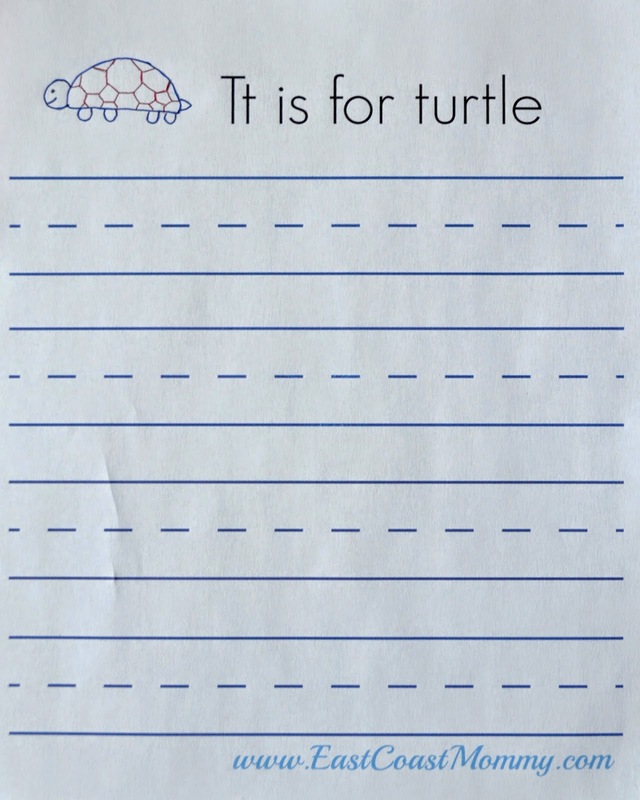 Try turning a "T" into a tree. Colour the trunk brown, and glue on scrunched up squares of tissue paper to create leaves. This scrapbook paper turkey is another sweet and simple letter T craft. 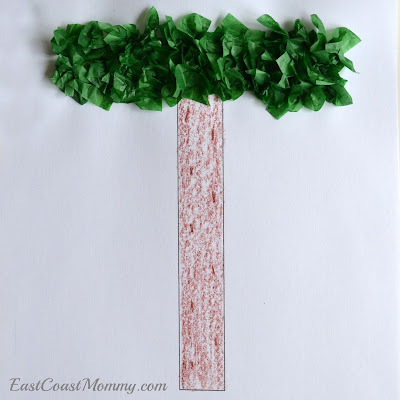 Cut a square of scrapbook paper, and glue it to a piece of cardstock. Add some heart feathers, a beak, and a heart wattle under the beak. Finish by gluing on a googly eye and drawing some feet. 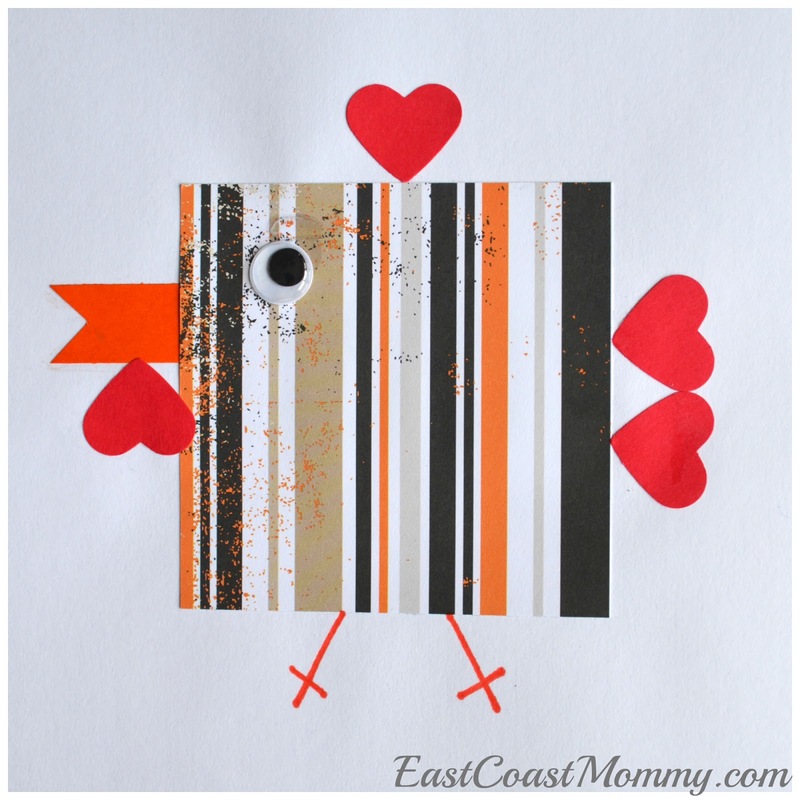 This would be a darling Thanksgiving craft too! 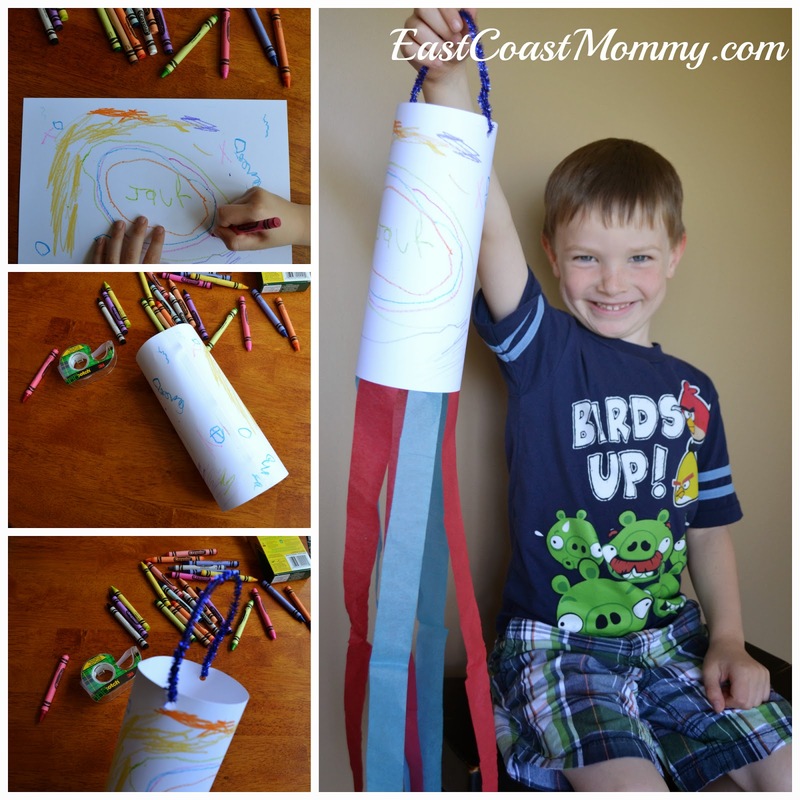 And how much fun is this paper towel roll train that stands up on its own? 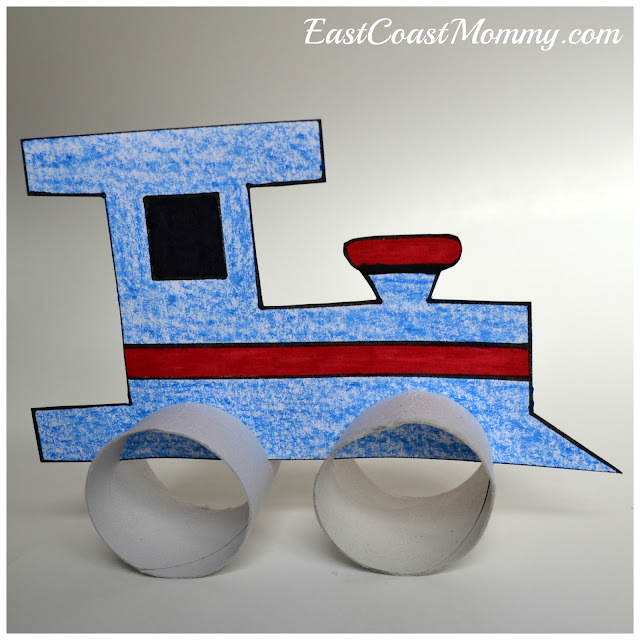 The children colour a train that is printed on cardstock and cut it out. Then, an adult makes it stand by cutting slits in pieces of a paper towel roll. Adorable, right? 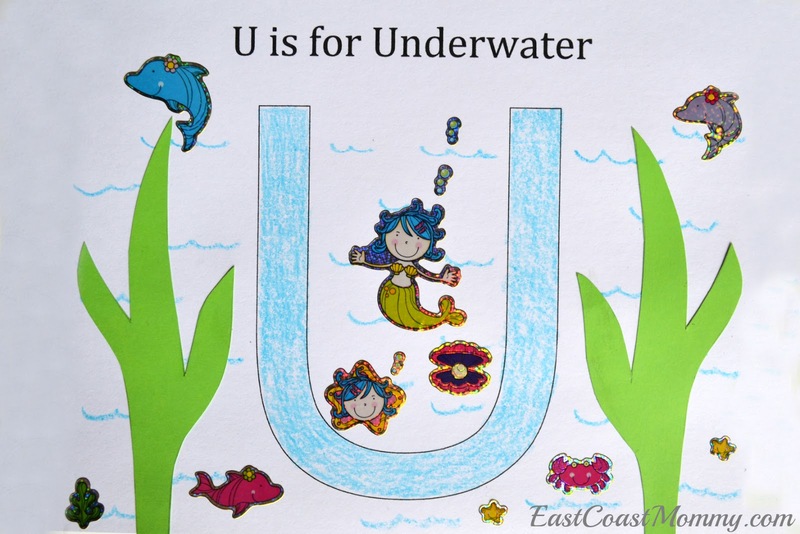 Next up... the letter U.